I love boots. 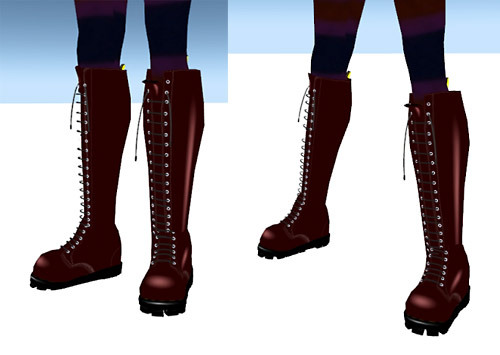 I love boots IRL too, but I can’t and wouldn’t want to walk in the kind of heels people have in Second Life, and find Doc Martens rip my feet to pieces so much they bleed, so they’re kinda out too. So what else to do but indulge in my love for boots on Second Life? I have three particular favourites right now. Here they are. Santa Baby boots, a group gift from Heart and Soul. I got Heart and Soul’s Santa Baby boots because they’re ideal for Christmas, but they’re also scripted to come in a number of colours, including purple and hunter green. They also have a resizing script, something I find vital! The group costs L$75 to join, and I believe the boots are also sold for L$100… and I’m looking forward to their future group gifts! Next, the best Doc Marten style boots I’ve found anywhere – Slade and Humby’s Dr Slade’s. I got my Slade and Humby’s Dr Slade’s in dark red, but other colours, including of course black, are available. They come with a resize script, and are in fact the only boots I’ve ever had to make smaller to fit me rather than larger! I forget how much they cost because I wasn’t thinking of blog posts at the time… they weren’t cheap, but they were definitely worth it! Can anyone tell me where I can find a pair of short DM sculpty boots that are as good as these? And perhaps the pinnacle of Second Life boots, the Prestige boot from Bax Coen. Bax Coen boots are legendary, and for good reason. The detail and soft, leathery texture are just perfect, and they come with a range of options. On the Prestige boot you can wear them with flap down, up, or off entirely, and change it to denim. You can also change the colour of the zip, heel, and sole. The Bax Coen service lived up to its reputation for me too – fitted remotely by a trained fitter in under a minute, so no fiddling with getting them perfect, it’s all done for you. Again I forget the exact price, but it was around L$900. A luxury item perhaps, but with luxury quality. I am uselessly failing to provide slurls, but search on the shoe store titles inworld and you’ll have no problem finding them. Next boot update, Western boots and purple slouchy boots from Maitreya. Real world physical beauty pressures in Second Life, at Cuppycake, and Un-idealistic avatars considered “griefing”? at Border House. I’ve often noticed how amazingly skinny a lot of avatars on SL are, though thankfully have never witnessed any bullying of larger avs myself (and if it was my land, I’d be ejecting and banning people for it if I did!). Still, I’ve noticed my own av getting a little thinner over the last year, mostly for the simple reason of getting clothes to fit right. Yes, as with RL fashion designers and their size 0 models, a lot of SL’s most beautiful clothing is made to fit people without noticable hips, or muscles on their legs. Tops are usually fine for me, but rarely do I buy a skirt that doesn’t require some stretching and moving around and fiddling with to make it look right on me, and rare are the boots that don’t demand I reduce the muscle tone on my legs. And my av is far from large. I’d just rather look healthy than eating disordered! Here’s an embarrassing look at the evolution of my av from n00b to now… glad I invested in some better skins, though of course I also learned how to take better pictures! Hello, I'm Sapphire, and this is my Second Life blog - place for me to post pictures of my virtual travels, and what ever random musings I happen to want to get out of my head. On SL I'm usually somewhere around the Solace Beach region, so pop by and say hi.